I love reading my little girl stories and we make a big deal of story time in our house. I’ve recently made some big crochet floor cushions, crochet of course, which I think are perfect for lounging on and cuddling when reading a good book. 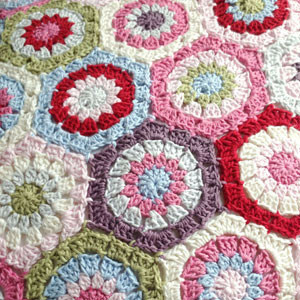 The first one is made using the brilliant Attic 24 Hexagon pattern, Rowan Handknit Cotton DK and Debbie Bliss Cotton DK. 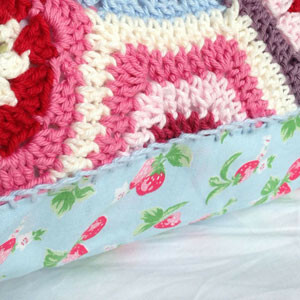 It is backed with Cath Kidston strawberry fabric using a really simple envelope style and I attached the back to the front using simple blanket stitch. 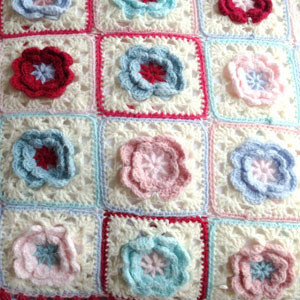 The second crochet floor cushion is made using the Flower Square pattern from Rose Hip and left over Bergere de France Caline in shades of turquoise, pink, red and aqua. Caline is an acrylic/wool mix which I don’t normally use; it is a more delicate than the Handknit cotton but I had some left over from another project and the colors were so lovely and this seemed like a great way to use them up! 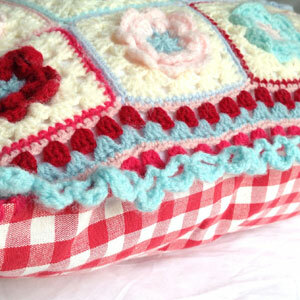 I edged it with extra rows of granny stitch as it wasn’t quite big enough to cover the cushion and then finished it with ‘Attic 24 Granny Blanket Edging‘. The back of this cushion is made using Laura Ashley red and white check fabric which I bought in the sale a couple of years ago because I liked it so much!